Despite having eaten 12+ courses at Manchester House on Friday night and rather a lot at a fabulous supper club on Saturday I woke up on Sunday thinking about food. Specifically about The Farmers Arms. Since visiting 3 times in the first couple of weeks after opening it had been a while since I’d last been and i’d seen and heard about loads of new dishes that I just had to try. After enjoying a pint of lovely cask ale, ‘Pike’ from local Blackedge brewery in Horwich the food quickly arrived. Firstly a dish I’d tried a development version of on my last visit ‘Macaroni & Cheese’. It looks more refined in it’s dinky, mini casserole dish but tasted every bit as good as I remembered. 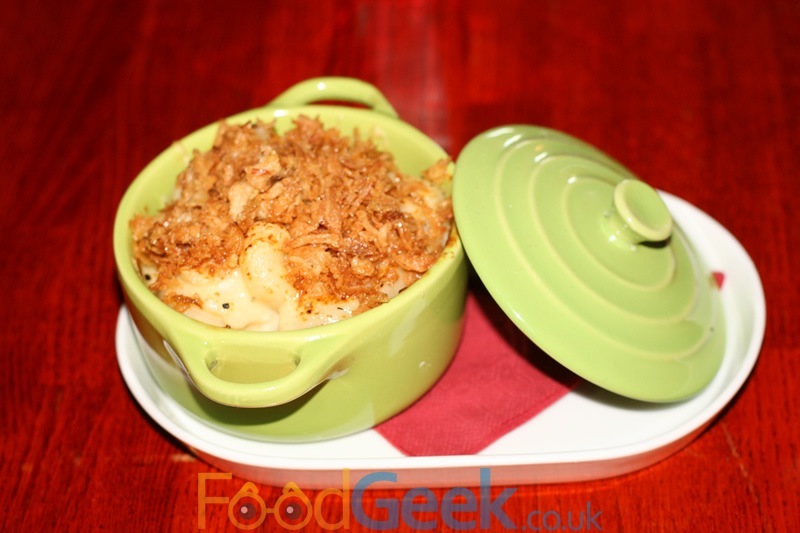 Soft macaroni in a rich, comforting three cheese sauce now topped with delicious crispy onions. From the ultimate comfort food to a stunning dish worthy of any restaurant ‘Venison Carpaccio & Beetroot, Orange & Walnut Dressing’. It looked absolutely beautiful and tasted just as good. The venison wonderfully tender with just a slight sear on the outside was complimented perfectly by the other flavours to make a seriously accomplished dish. Whilst on holiday in Spain I had a sudden craving for proper, traditional fish & chips. Of course I didn’t find it there and haven’t since i’ve been home either. So as soon as I spotted it on the regular menu I couldn’t resist ordering, even though it meant ignoring the more interesting sounding dishes on the specials board. I wasn’t disappointed! 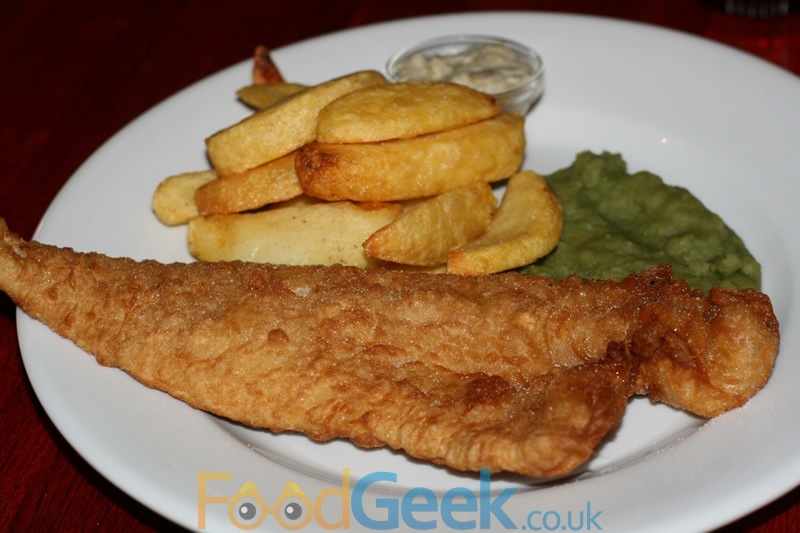 A decent sized piece of haddock in a crispy batter with really good chunky chips, excellent mushy peas and a very good homemade tartare sauce. It was exactly what I’d hoped and pretty much as good as fish & chips gets. 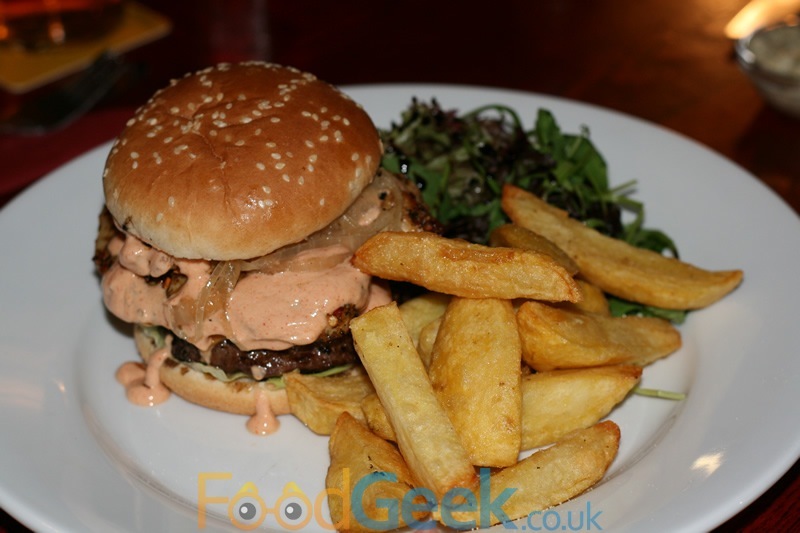 Mrs FG went for the equally comforting but more exciting sounding ‘Peri Peri Chicken Topped Cheeseburger’ and it was another triumph! 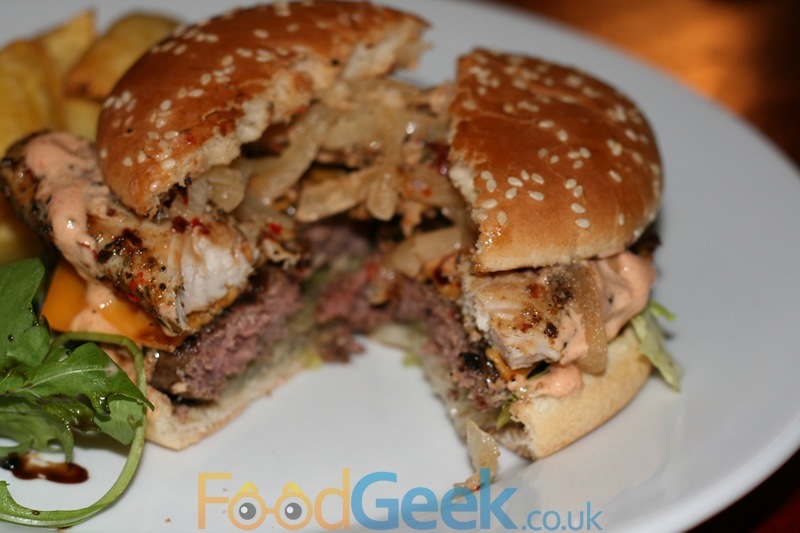 A perfectly cooked, medium rare beef patty topped with peri-peri chicken, fried onions and a stunning spicy mayo with a really good kick. It tasted so good I even forgave the slice of ‘American cheese’ which I don’t generally get on with but have to admit can work with burgers and it did here. 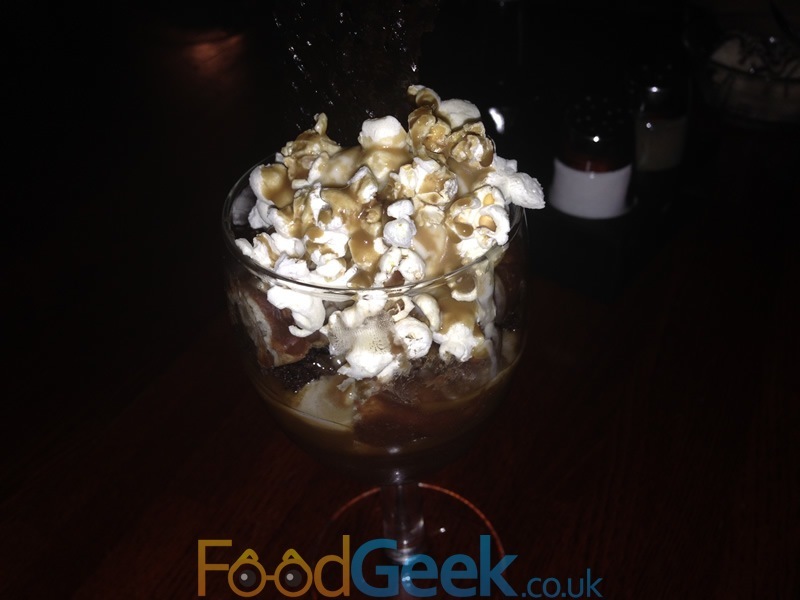 All the food at The Farmers Arms is great but it’s the desserts that really stand out. The ‘Snickers Creme Brûlée’ and ‘Chocolate & Orange Pie’ i’d had on previous visits are up there with my favourites of the year. 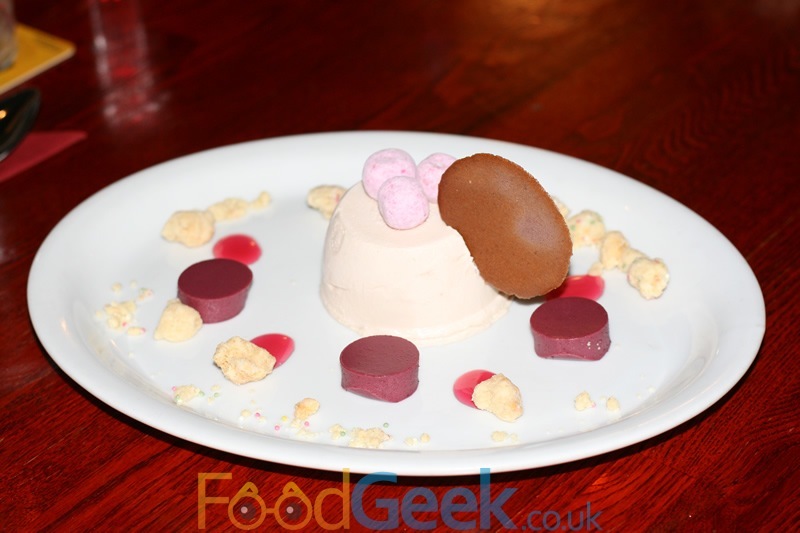 The intriguingly named ‘Purple Haze’ features a frozen Vimto parfait, blackcurrant panna cotta & blackberry crisp. It’s another pretty and very refined dish. Any dessert featuring Vimto is always going to be a winner for me so it’s no surprise that it was the element I liked best. Although the other elements worked well i’d have been happy with just a larger parfait. The ‘Toffee Popcorn & Donut Trifle’ is as bonkers as it sounds, in a good way. Simply a glass full of sticky things, shamelessly indulgent, fun and delicious. The thing I love about The Farmers Arms, besides the high quality of cooking is the perfect mix of comfort food and more high end, refined dishes. 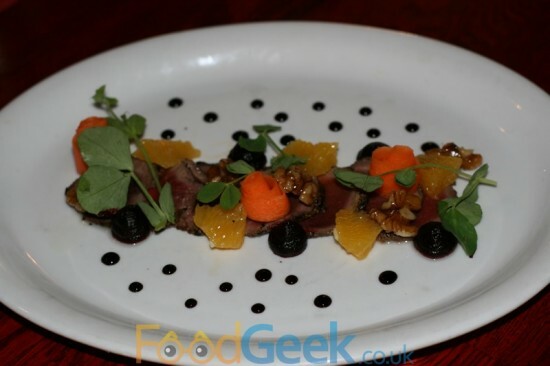 There aren’t many places you can go for mac & cheese, traditional fish and chips or a decent burger as well as dishes as stunning and beautiful as the venison carpaccio. Speaking to chef Jon Jones about it he says it’ll only increase in the future. He plans to slightly simplify the regular menu to include more classics which will keep the pub crowd happy while at the same time allowing him to create even better and more exciting specials. It’s great to have both options available and i’m looking forward to seeing what comes next.